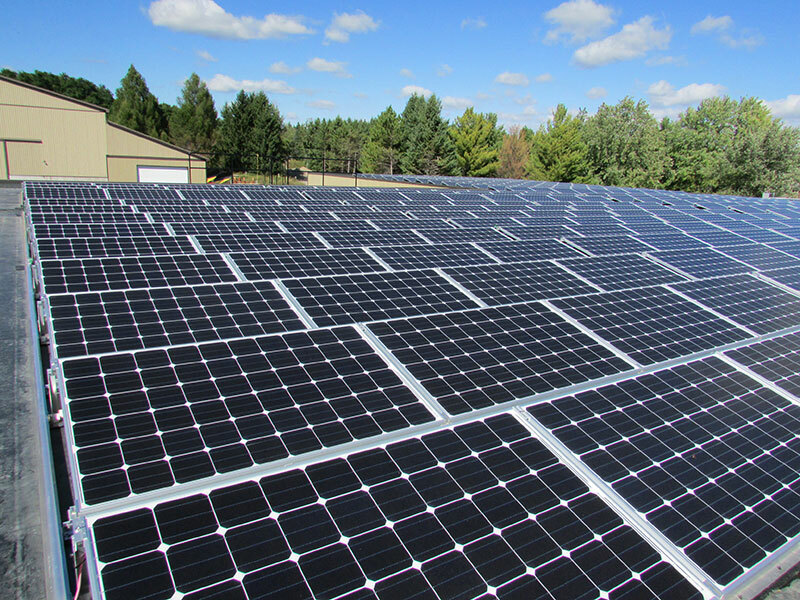 In 2014 the Town installed a 100 kW solar photovoltaic system on the roof of the public works garage. 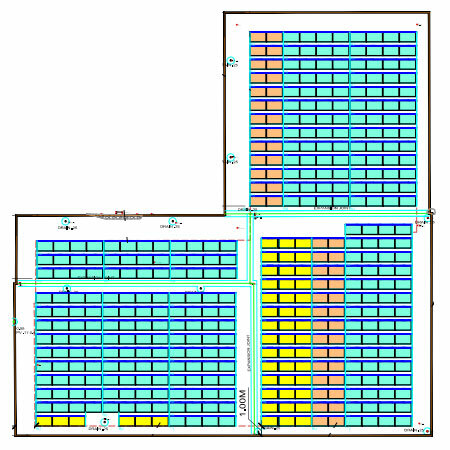 The system is nominally rated at 100 kW though the capacity of the solar arrays totals 118 kW. The power is then converted from direct current that the solar panels generate to alternating current by 9 inverters. From there, it is piped to Hydro One through a meter that records the amount of electricity that is sold to Hydro One. Hydro One pays the town 54.8¢ per kilowatt hour (kWh) that the town generates. 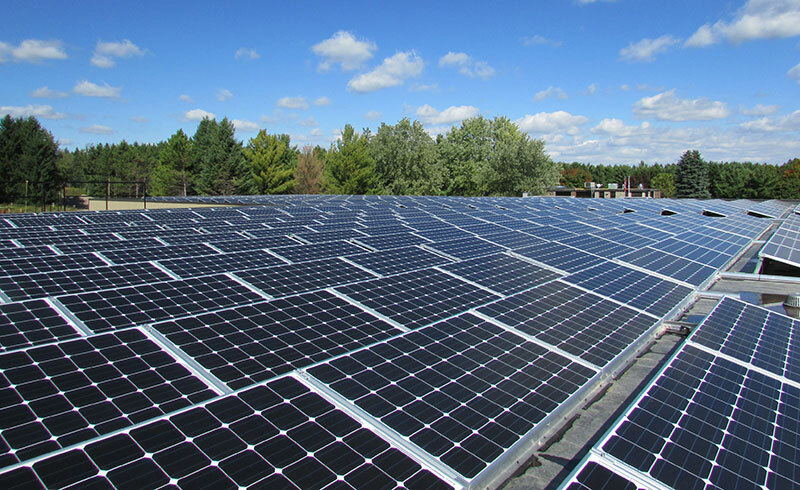 The system was built under the terms of Independent Electricity System Operator's (IESO) Feed-in Tariff Program. "The fundamental objective of the FIT Program, in conjunction with the Green Energy and Green Economy Act, 2009 (Ontario) and Ontario’s Long Term Energy Plan, 2010, is to facilitate the increased development of renewable generating facilities of varying sizes, technologies and configurations via a standardized, open and fair process." creating new green industries and jobs. "The Town of Mono will be a safe, sustainable municipality where the new Economy, our Environment, our Community and our Natural Heritage can flourish in harmony." 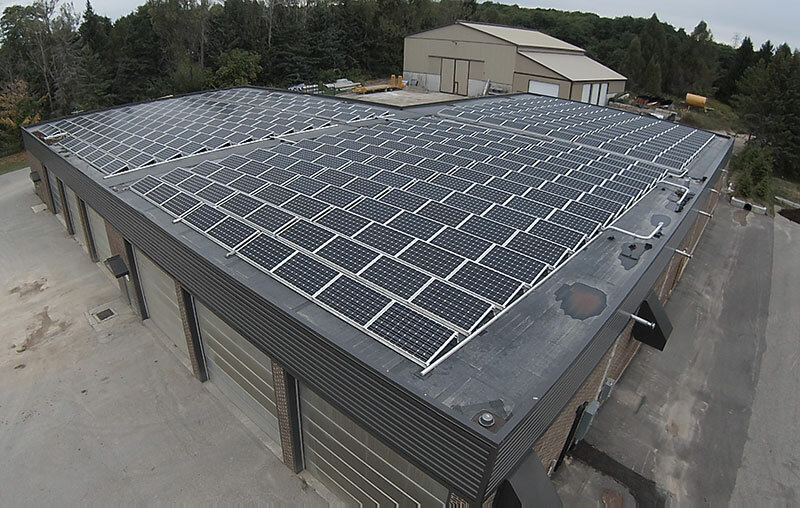 Mono Council made the decision to investigate the option of installing a solar array and to take advantage of the Feed-in Tariff program in 2012. Following a feasibility study, an application was made to Ontario Power Authority (OPA) in January 2013 which was subsequently accepted by OPA in August 2013. 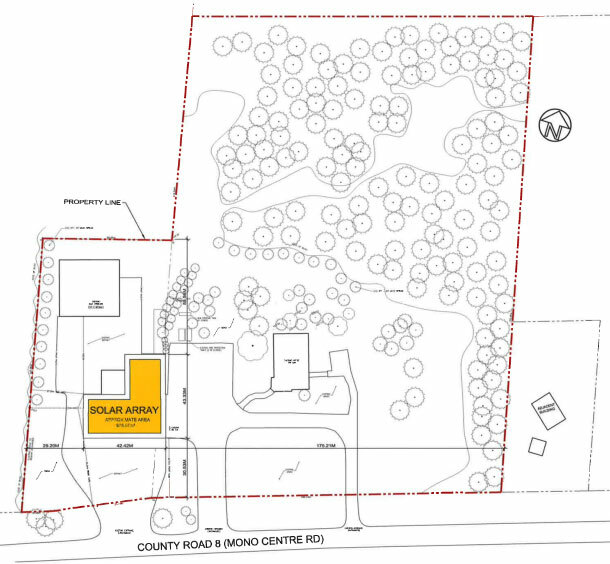 Following a tender process, RESCo Energy Inc. of Mississauga, ON was selected as the contractor with construction beginning in August 2014. Note that in 2014 the Provincial government merged OPA into IESO. 414 solar panels, each 285 watts, are mounted on the roof of the Public Works Garage. The panels covert sunlight into direct current electricity. This is sent to 9 power inverters that convert the electricity to alternating current. Once converted to AC, the electricity is fed to Hydro One, who sells it to Ontario Power Generation. Mounting System SCIROCCO® system low ballast flat-roof PV installation hb Solar Inc. The entire project, including the cost for Hydro One to install a transformer to receive the generated electricity, was $391,431. This was entirely funded from the Town's reserves of over $5.5 million. Revenue projections are based on the contract price of 54.8¢ per kWh that IESO pays the town. The more electricity that is generated, the more money the town makes. The caveat, of course, being that power generation is based on how much sunshine we receive. To determine that, we employed the RETScreen Software Suite. RETScreen is a Clean Energy Management Software system for energy efficiency, renewable energy and cogeneration project feasibility analysis as well as ongoing energy performance analysis. In calculating an energy model, it takes into account historical daily solar radiation data (i.e. how much sunshine we get), photovoltaic panel and inverter efficiencies. We then added a further factor to account for the panels being fully or partially covered in snow during winter months1. Based on these calculations, the town estimates that we will generate a total of 132 MWh annually. At the contract price of 54.8¢ per kWh ($548 per MWh), that works out to $72,336 per year. Taking into account inflation, calculated at 3% per year, over its 20 year life the solar array is expected to generate $67,300 per year. In addition to the initial capital investment of $426,587 we anticipate annual maintenance costs of $5,170. Therefore, our anticipated annual net revenue is $62,130. At that rate, it will take 7 years to re-pay the Town's capital investment. 1 Calculations of power generated from December through April assume that the panels are covered by snow for the percent of the days shown in each month. Additionally, the power inverters will need to be replaced at the mid-life point (10 years) at an estimated cost of $40,000. Total annual costs including maintenance and debt retirement (over the life of the system) are expected to be $26,500. 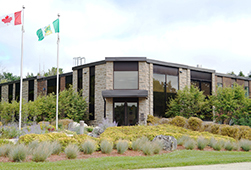 Taking into account the capital cost, annual maintenance and the mid-life costs, over the system's 20 year life, the town anticipates generating a net revenue of approximately $800,000. 2 Capital came from reserves; it was not financed. Debt retirement payments are made to the Town. 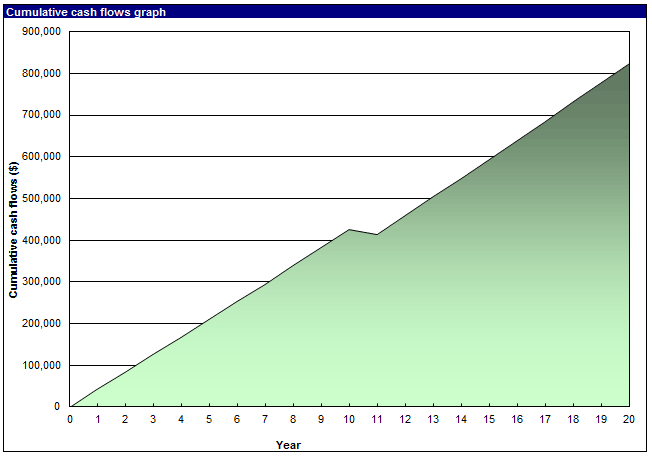 As shown above, the financial motive for investing in a rooftop solar system is significant. Equally important are the environmental benefits of employing renewable energy systems. If the equivalent amount of electricity that this solar array will produce in one year had to be generated by burning coal, 128 tonnes of greenhouse gases (GHG) would be produced. If natural gas were used to generate the 138 MWh that this system will generate in a year, 69 tonnes of greenhouse gases would be pumped into the atmosphere. It goes without saying that solar photovoltaic systems, which produce zero GHG, provide a substantial benefit to the environment. Compared to generating electricity by burning natural gas, the Town's solar photovoltaic system will, over its 20 year life, save 1380 tonnes of carbon dioxide (tCO2) from being pumped into our atmosphere.